Just because you're eating a salad doesn't mean you aren't consuming a lot of calories. Most raw nonstarchy vegetables contain only about 25 calories per cup, but other salad ingredients can add a significant number of calories to your tossed salad if you aren't mindful about portion sizes. Use low-fat versions of cheeses and dressings to help minimize the overall calorie content of your salad. 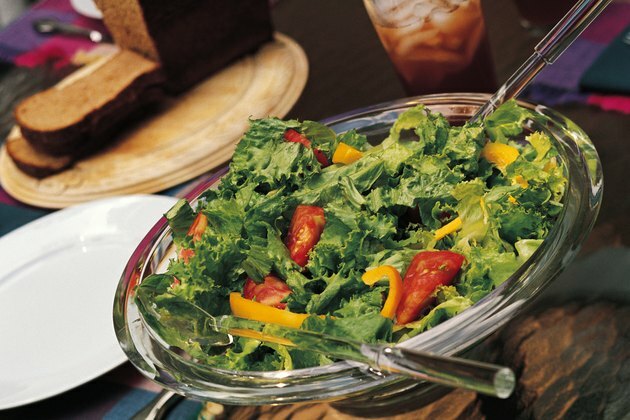 A 1 1/2-cup tossed salad containing just vegetables has about 33 calories. If your salad also contains eggs and cheese, the same-sized salad has about 102 calories, and when you top your salad with chicken instead, it will have about 105 calories. This is before you add dressing. Each tablespoon of regular Italian dressing contains 36 calories, regular ranch dressing has 63 calories per tablespoon and reduced fat ranch dressing has 29 calories per tablespoon. A salad with 2 cups of lettuce or spinach, 1/2 cup of sliced carrots, a cup of cherry tomatoes and 2 tablespoons of fat-free Italian dressing has about 100 calories. Add a 1/2 cup of grilled chicken and you're adding just 61 calories, but if you choose fried chicken instead, you'll add 194 calories.